Every day in America, children are transported to school, field trips and other events using school buses or other school vehicles. Parents trust that school bus operators, owners and manufacturers will ensure the safety of their children as their number one priority. When this does not happen, accidents can occur. 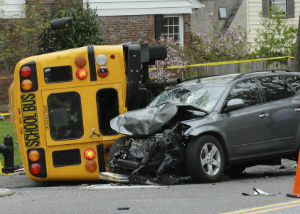 School bus accidents often lead to serious injuries and fatalities. That tragedy is compounded when these auto accidents are due to negligent factors. The compassionate attorneys at The Edwards Law Firm can support you in getting the full compensation you deserve for the damages and heartache your family has received due to a school bus accident. Negligent maintenance of school vehicles – This occurs when a school bus owner does not properly take care of the vehicle, making it unsuitable and unsafe for passengers to ride. Faulty vehicle defects – These faulty vehicle defects happen when a bus or vehicle is improperly designed or has a defect due to how it has been manufactured. Negligent behavior of the bus operator – This negligent behavior occurs when a driver is operating a bus and may include texting or talking on a cell phone, intoxication, driver fatigue, violating traffic laws or putting a passengers safety at risk in other capacities. Our knowledgeable and experienced auto accident attorneys serve as advocates in navigating the many complex issues such as legal liability and state laws for your school bus accident lawsuit. We have recovered millions in damages, and we only get paid when you do.